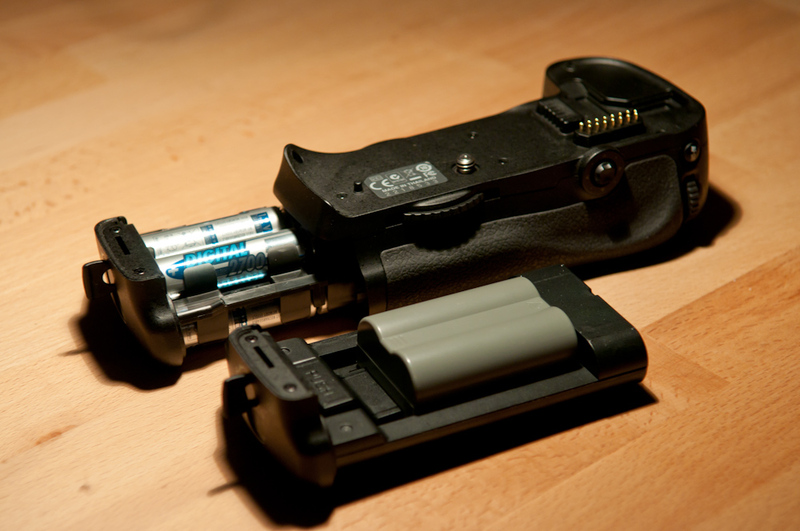 I have a MB-D10 battery grip for my D300s. Battery grips are screwed below the camera, they hold, well, a battery and another set of buttons, which allows you to shoot upright pictures while holding the camera the usual way. Now to the issue I discovered this week-end. I was out in the park, shooting friends with a baby (shooting pictures, keep the jokes). When I paused to flick through the images, I was unnerved by a strange phenomenon. In unregular intervals the viewing mode was left, the screen went black and I had to push the playback-button again. Same with scrolling through the camera menus. At first I thought my clumsy fingers touched a button on the MB-D10, but the problem persisted when I held the camera only with my fingertips, careful not to touch any button. camera set to “use the internal battery first, when depleted use the one in the battery grip”. Change any of these settings and everything is fine. I used AA NiMH batteries – no problem. I used the third party battery in the grip and set the camera to “use battery grip first” – no problem. I do not know whether this is a “feature” implemented by Nikon to push their own batteries (is there a chip or something in the EN-EL3e batteries ? I don’t know) or if the low price from the third party guys has its price (bah, that’s a Euro into the stupid-phrase piggybank). Conclusion: When using an MB-D10 use AA batteries, original Nikon batteries or set the camera to “drain battery grip first”.